I came into this game thinking that Uruguay had a decent chance to earn a result against their heated rivals, Argentina. In a way, I was right. 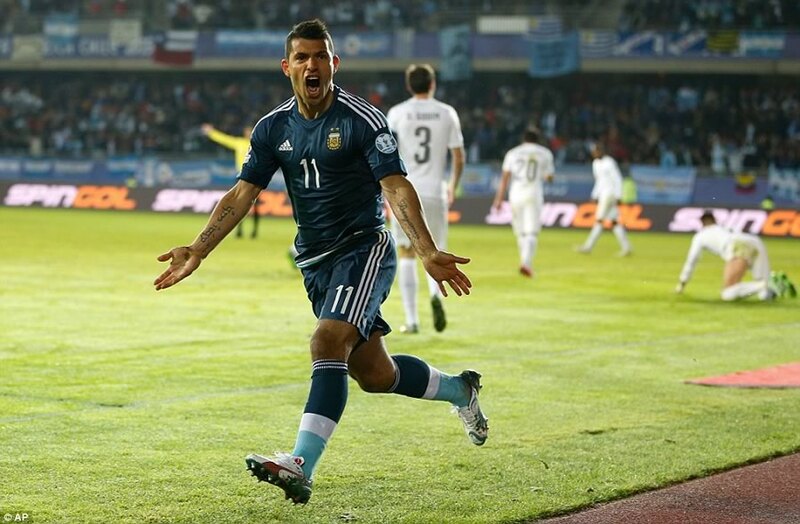 However, missed chances by Uruguay, and one incredible goal by the Albicelestes gave Argentina a 1-0 group stage win. Let’s take a look at the particulars, and see how this affects the group. This was a hard-fought game from the beginning, which is what you would expect from a rivalry that has been around since Argentina hosted the first South American championship in 1916. Argentina held the tournament to commemorate it’s 100th year of independence, and Uruguay came to town and won it. And the next year too. We’re such jerks! Just ask the Brazilians about the Maracanazo, and you’ll find out. Anyway, the first half involved a lot of feeling each other out and, thanks to some staunch defense from Diego Godín and his crew, and a nifty save or two from birthday boy Fernando Muslera, ended in a 0-0 tie. Argentina seemed to have the upper hand, as any team with their type of star power probably should, but both teams had a couple of chances to score. Godín himself barely missed hammering home a header on a corner, and Muslera made a great save on a shot attempt by Sergio Agüero. The second half got a lot more intense. Even the commentators on Bein Sports noted that, while the game wasn’t a high scoring and exciting affair like Chile vs. Mexico the night before, it was the tension between the two sides that made the Argentina and Uruguay clash feel so big. In the 56th minute, something finally gave, and Argentina scored to go up 1-0. It was a beautiful goal, started by PSG’s Javier Pastore, who drove to just outside the box on the right wing and found Pablo Zabaleta, who blistered a perfect cross to the head of his Manchester City teammate Agüero, who hammered it home through the only space Muslera managed to leave open between himself and the right post. It was ridiculous. You can see it at the end of this post. After that, as Uruguay realized it needed a goal to salvage a point, and Argentina realized they needed to hang onto their win to be in good shape for the third group stage match day, things got way more tense. Several times, we saw some pushing and shoving and hard fouls from both sides. Barcelona man Javier Mascherano was, at one point or another, seemingly in the face of every Uruguayan who even touched Lionel Messi. To be fair, the Uruguayans definitely got more aggressive with their tackling when they went down by a goal, although I didn’t see anything dirty from both sides. Just a lot of tension and hard-nosed fútbol–the kind we’ve come to expect from this rivalry match up. Uruguay had several chances to equalize, but came up short. At one point, a rebound found its way from Argentinian goal keeper Sergio Romero, right to the foot of Diego Rolán, who hit it over the net and not into the gaping wide net. You can’t do that, buddy. Later, Álvaro González ended up just outside the top of the box with the ball after a clearance by Argentina, and his arching shot came down just above the right corner of the net. Rolán had a chance at redepmtion at one point, but his header was saved by Ramos. La Celeste finally subbed in Hull City striker Abél Hernández in the 69th minute (maybe a little too late? ), and he unleashed a beautiful one-time volley that Ramos made another incredible save on in the 90th. For a guy who can’t buy a cap at Monaco, Romero has been pretty damn good for the Albicelestes since last summer. Anyway, a loss is always going to sting, especially now that Uruguay is third in the group with three points, but I thought they held their own against the Argentinians, and were just a couple of bounces away from a draw, and even a win. They came as close to neutralizing Messi as you’re going to come, and the one goal Argentina scored was on a world class play by a couple of world class players. I think Tabárez is going to need to make some changes for the Paraguay game on Saturday (more on that in the next couple of days), but I do think Uruguay will play up to the occasion. Assuming Argentina beats Jamaica, a win against Paraguay would give La Celeste second place in the group, but I’m pretty sure they’ll end up moving on as a third place team with just a tie. Here’s hoping the Charrúas take care of business this weekend.